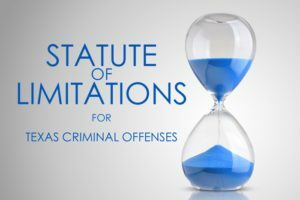 Statute of Limitations in Texas | How Long Does the State Have to Bring Charges? Home » NEWS » Statute of Limitations in Texas | How Long Does the State Have to Bring Charges? How Long Does the State Have to Bring a Criminal Case Against Me? Texas law sets out the statute of limitations, the period during which formal charges must be brought against the defendant for most offenses. These time periods range from two years to over twenty years, and for some offenses there is no limitation period at all. The applicable limitation period depends on the particular offense that is alleged. The various statutes of limitations mean that the state must present an indictment or information within said time period or prosecution will be time barred. The presentation of an indictment occurs when the grand jury has made its decision and the indictment is received by the court. Tex. Code Crim. Proc. Ann. Art. 12.06. The presentation of an information occurs when it has been properly filed in court. Tex. Code Crim. Proc. Ann. Art. 12.07. The limitations period is tolled while the case is pending after an information is filed or indictment issued. Tolling means that the time will not be counted against the limitations period. Generally, the time period is measured based on the date the offense was committed. When computing the time period, the day on which the offense was committed and the day on which the charge was presented are excluded. Tex. Code Crim. Proc. Ann. Art. 12.04. Thus, the clock starts running the day after the offense was committed and is paused when the indictment or information is presented. Additionally, any time the defendant was absent from the state is excluded when computing the time period. Tex. Code Crim. Proc. Ann. Art. 12.05(1). What Are the Time Periods in the Texas Statutes of Limitations? Texas law provides that for all misdemeanor offenses there is a standard period of limitations of two (2) years. Tex. Code Crim. Proc. Ann. arts. 12.02. Thus, for any given misdemeanor charge, the State must bring prosecution within two years from the commission of the crime. There are several periods of limitations provided for the various felony offenses, as well as a catch all time period of three years for all other felonies not specifically provided for. Tex. Code Crim. Proc. Ann. art. 12.01(7). See the chart below for the time period provided for certain major felony offenses. See Tex. Code Crim. Proc. Ann. art. 12.01(4). See Tex. Code Crim. Proc. Ann. art. 12.01(3). See Tex. Code Crim. Proc. Ann. art. 12.01(2). See Tex. Code Crim. Proc. Ann. art. 12.01(6). See Tex. Code Crim. Proc. Ann. art. 12.01(5). See Tex. Code Crim. Proc. Ann. art. 12.01(1). See Tex. Code Crim. Proc. Ann. art. 12.01(7). In conclusion, these limitations are set out to protect defendants from having to face charges where evidence is stale and witnesses are unavailable due to the long period of time the State has waited to bring prosecution. The Texas Code of Criminal Procedure is very specific in how it has laid out the periods of limitations so that there will be no question as to the time period for a particular offense and how that time period should be computed. *Note: The above provided chart is not all-inclusive but instead focuses on only some of the major felony offenses. An exhaustive list can be found in Section 12.01 of the Texas Code of Criminal Procedure.